ClashTalk Lunch Poll: What Would You Put In Your Time Capsule? Earlier this week in Boston, a time capsule that was placed inside a lion statue in 1901 was opened at a private reception. 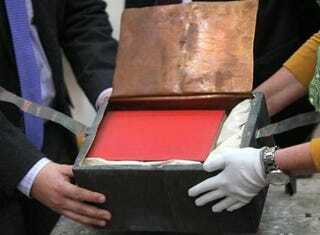 The metal box contained a bright red book and a few other items (unrevealed to the public for now). While we all speculate about what the time capsule contains (and what the book's all about), let's think about what we'd put in our own time capsules. What would you all put in your time capsules, ClashTalkers? Where would you want it buried? When would you want it opened?